The First Stage QSchool Results can be found at the bottom of this article. The 2017 European Tour Qualifying School started on Tuesday 12th September. A new Far East First Stage Qualifying competition had been scheduled to be played at Saujana G&CC in Malaysia on 5th September. However, the Tour cancelled this on 23rd August due to a lack of interest. The First Qualifying Stage consisted of eight separate 72-hole events which were split into four Sections, A, B, C and D. The final Section D events of the series came to a conclusion on 6th October. There were 54-hole cuts at each of these Qualifiers. Only those players who were within 7 shots of the final allocated qualifying place at this point played the final rounds. 2017 saw a record First Stage entry with a total of 838 competitors signing up. 45 countries were represented with England contributing the most with 211 players. The leading five Q-School entrants as at 23rd August 2017, up to a limit of 15th place, in the World Amateur Golf Rankings were exempted into the Second Stage. This year Scott GREGORY (ENG), Connor SYME (SCO) and Robert MACINTYRE (SCO) were therefore not required to contest the First Stage. The European Tour Q-School entrance fee is €1,800. Each First Stage Qualifier has a prize fund of €5,000 with the winner being allocated €1,800. At the end of the series 176 players were allocated places in Second Stage. That’s 21% of the entries received. The Second Qualifying Stage consists of four separate 72-hole events that will be played concurrently in Spain on 3rd-6th November 2017. The Final Qualifying Stage consists of 108 holes at Lumine GC which has taken over from PGA Catalunya Resort this year. This competition will be played on 11th-16th November 2017. As in previous years I am following the Q-School series, specifically focussing on the amateur and recently turned pro entries from Great Britain & Ireland. The six 2017 NCAA Men’s Division I Regional Championships have been concluded today across the United States. 450 players, made up of 81 five man Teams and 45 Individuals, competed over 54-holes of stroke play to determine who would progress to the National Championships. The low five teams and the low individual not on those teams advanced from each Regional. This year’s Finals are being staged at Rich Harvest Farms in Sugar Grove, Illinois between 26th-31st May. There were four Great British and Irish (GB&I) players that negotiated this tough test. These were Harry ELLIS (Florida State), Elliot FULLALOVE (Jacksonville), Harry HALL (University of Nevada, Las Vegas) and David WICKS (Jacksonville). Ellis, Hall and Wicks are all on Europe’s 2017 Arnold Palmer Cup team for the match against USA in early June. In something of a surprise two of our leading players, Sam HORSFIELD (Florida) and Paul MCBRIDE (Wake Forest), members of two of the seeded and stronger teams, failed to qualify. There were no GB&I qualifiers from the Austin Regional. Paul MCBRIDE and his Wake Forest Team (seeded 10th) had been strongly fancied to progress before play started. 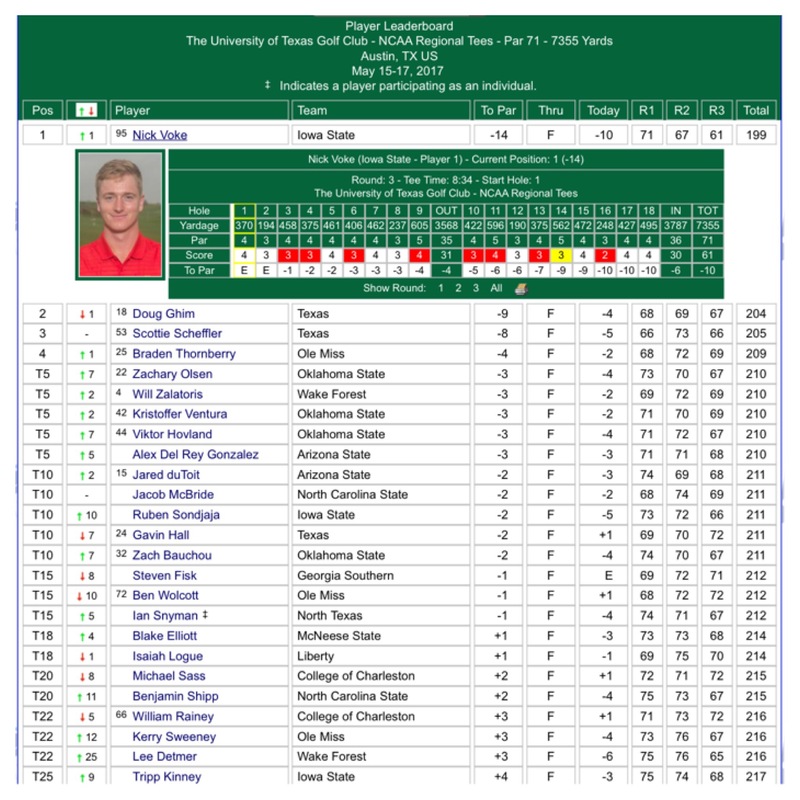 In passing Nick VOKE‘s final round 61, which helped the Iowa State man to the Austin Individual title, on the 7,355 yard University of Texas GC is certainly worth acknowledging. David WICKS and Elliott FULLALOVE progressed to the Nationals following a play-off between their Jacksonville Team and Northwestern who Ryan LUMSDEN represents. Wicks had an eventful day. On the fourth hole, his 13th of the day, he accidentally dropped his ball into a lake by the green. After a five minute paddle he failed to recover his ball and was forced to record a double bogey six. It was to his credit he managed to par his way home thereafter. Missouri finished 8th in the Team competition. As a result neither Euan WALKER or Rory FRANSSEN progressed despite reasonable individual performances. There were no GB&I players competing at Stanford. 2016 US Amateur runner up Brad DALKE (Oklahoma) won the Individual event by 3-shots with an impressive -12 score. Harry ELLIS continued his good season in the US with a strong Individual performance that led Florida State into the National finals. Harry HALL enjoyed an excellent tournament finishing 6th with an Even par total after rounds of 73, 70 and 73. UNLV also won the Team competition ensuring that they will also progress to Illinois next week. Pavan SAGOO also played well. His scores of 71, 70 and 78 left him in a very creditable tied 10th place in the Individual standings. Unfortunately his St. Mary’s (CA) Team finished tied 6th and he was not the best placed Individual from the non-qualifying teams so his College season has ended. However, the main story from this Regional was the failure of 5th seeded Florida and Sam HORSFIELD to progress. Good luck to our four players in next week’s Nationals. 450 players, made up of 81 five man Teams and 45 Individuals, will commence play tomorrow in the 2017 NCAA Division I Regional Championships. 54-holes of stroke play over 3 days at 6 venues across the United States will determine those players that progress to the National Championship. The low five teams and the low individual not on those teams from each Regional will advance. This year’s Finals, where Team and Individual medalist titles will be decided, are being staged at Rich Harvest Farms in Sugar Grove, Illinois between 26th-31st May. Oregon won the team title in 2016, defeating Texas, 3-2 in the match play final. Oregon’s Aaron Wise also claimed the individual title with a four-day total of 280 (-8). Here is a list of all the Teams and Individuals that have been selected to compete by the NCAA Golf Committee. The Teams are seeded at each venue and are therefore ranked in order of their 2017 playing records. Where applicable, the Conference each Team won to automatically qualify is also shown in brackets. I have additionally highlighted in BOLD the GB&I golfers in each Team as well as those who are playing as Individuals. I believe 2016 will prove to be an historic U.S. Amateur Championship for Great Britain & Ireland (GB&I). I say this because I can’t recall six of our players progressing to the match play stage before and certainly not one from each of the four home nations. Unfortunately one of our qualifiers couldn’t go on to win it ! David Boote (WAL) was the most successful reaching the quarter-finals of the match play stage. Here is the story, at least from from a GB&I perspective, of the 2016 U.S. Amateur Championship played at Oakland Hills CC, near Detroit. Curtis Luck (AUS) won the 2016 U.S. Amateur champion, beating Brad Dalke (USA) 6&4 in the 36-hole Championship match at Oakland Hills CC, in Detroit. Curtis Luck (SPWAR 37 / WAGR 7) went into the final as the favourite based on his superior world rankings; Brad Dalke (SPWAR 180 / WAGR 265) sitting well below him. In many respects both players have already won though; by reaching the Final both Curtis and Brad guaranteed themselves invitations to the 2017 Masters and U.S. Open. By winning Curtis also picked up an invitation to The Open. Of course all of these exemptions are subject to them remaining amateur players. Local player Nick Carlson made a good start to this semi-final taking a 2 Up lead after just 3 holes. Australian Curtis Luck hung around and eventually got the match back to 1 Down with 1 hole to play. Tragically for Carlson he could only manage a double bogey 6 letting Luck square the match on 18 with a bogey 5. Both players parred the 1st and 2nd holes before Luck birdied the par 5 3rd to take the lead for the first time all day and to make it through to the Final. In the second semi-final Californian Jonah Texeira led 2 Up at the the turn. However, he proceeded to bogey 10 and 11 allowing Brad Dalke to draw level. Two birdies on 13 and 15 and a badly timed bogey on 14 by Texeira allowed Dalke, 19 yesterday, to pull away, the man from Oklahoma securing a 3&2 victory on the 16th green. Brad Dalke is well known for two things – ‘signing’ for Oklahoma College when he was 12 and beating Rory McIlroy in an arm wrestling match at the 2015 Junior Invitational at Sage Valley. He also has some game which he demonstrated by starting this quarter final with five birdies in his first 6 holes. It was to David Boote‘s credit that despite this onslaught he managed to turn just 2 Down after three birdies of his own. Boote continued to play well on the back nine but further birdies from Dalke on 11 and 16 were good enough to secure a 3&2 win for the American. David Boote played his best round of the week thing to Dalke. It was just one of those match play days for the Welshman (who lives in Surrey, England 😉) where he came up against an unstoppable Dalke A-game. Interestingly Dylan Meyer, who enjoyed such a good day yesterday, ran out of steam on the back nine of his quarter final losing 3&1 to Nick Carlson after three bogeys and one double bogey. There are no easy matches at this stage of the U.S. Amateur and the two facing our remaining GB&I representatives were certainly no exception to this rule. Meyer’s amazing short game and putting skills were again on display as he and Sam Horsfield played out a quality match where par golf was largely the order of the day. With no player able to take command of the match it was always likely to come down to a small error. Meyer holed a 15 footer on 18 to take the match back down the 1st and was quickly rewarded when Horsfield missed a short 3 footer for par gifting the Indiana-man the win. It was some day for Western Amateur champion Meyer who knocked out medalist Alex Smalley in the morning before seeing off Sam, the SPWAR No. 1 ranked player in the world, in the afternoon. Collin Morikawa, a California college golfer, and former Stanford-man David Boote will surely have been well known to each other before their Rd of 16 match teed-off. Birdies on the first two holes by Boote would have sent a clear message to Morikawa and whilst the Californian got the match back to even on the 4th poor bogies 0n 5, 7 and 8 handed back the initiative to Boote. With a 3 Up lead to defend on the back nine Boote had the mental fortitude and golfing ability to par his way into a 2&1 victory which he secured on the 17th. This was a very impressive win for the Welshman as Morikawa has been in excellent recent form, winning the prestigious Sunnehanna Amateur before finishing second at the Air Capital Classic on the professional Web.com Tour. Three GB&I players progressed to the Round of 32. Sam Horsfield celebrated moving to the top of the SPWAR earlier this week by playing his very best golf to beat Doc Redman this morning. He shot 29 on the front nine before finishing the match 7-under on the 14th. Let’s hope he hasn’t used up all his putts this afternoon as he now has to face his recent nemesis, Dylan Meyer. Meyer beat Horsfield two weeks ago in the final of the Western Amateur Championship. Scott Gregory played really well – he was 3-under for the 19 holes with just one bogey – but came up against an in form Nick Carlson. Despite fighting back from 3-down with 8 holes to play to take the match into extra time the excitement was short-lived. A 10-foot birdie putt from the local Michigan man saw him progress. In probably the least spectacular match of the three involving GB&I players David Boote wore down Ben Schlottman to progress to the last 16. Boote had three birdies and two bogies but pulled away as Schlottman appeared to lose his game a little on the back-9. 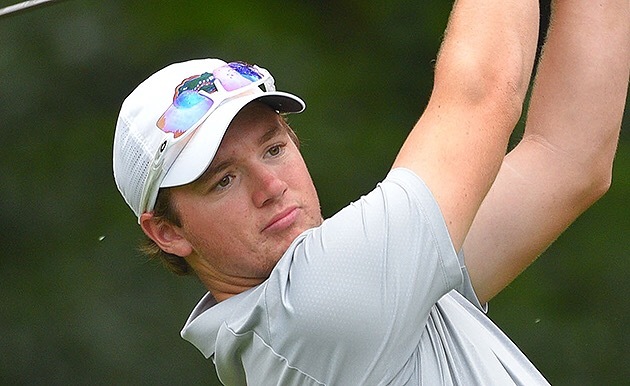 Connor Syme and Sam Horsfield both came up against recent amateur championship winners – Dylan Meyer won the Western Amateur whilst Hugo Bernard picked up the Canadian Amateur title just last weekend. In tight matches Syme was beaten 2Up, losing the last two holes to par, whilst Horsfield, who shot -4 for the 17 holes he completed, managed to ease out the competitive Bernard. Sam Horsfield has Terry Mundy, a family friend and the long-time caddie of Ian Poulter, on his bag at Oakland Hills CC this week. Scott Gregory had a much easier task in his match against Raymond Knoll who simply never got going today. Knoll bogeyed 7 of the 13 holes they completed making life far too easy for the confident Amateur champion. Afternoon rain and thunderstorms in the Detroit area led to a two hour suspension in play between 3.40pm – 5.40pm local time. Unfortunately the tough finish on Oakland Hills South Course proved too much for both Bradley Moore and Jack Hume. Moore did very well to fight back to All Square against the highly rated No. 2 qualifier Dawson Armstrong having been 2 Down with 6 holes to play. However, having birdied the 13th and 16th, he bogied the last two holes to let Armstrong progress. Hume was 1 Up with 3 to play before he bogeyed 16 and 17 to give his opponent, Bryson Nimmer a 1 Up lead heading up the 18th. With the hole halved in par Nimmer moved on from another close match. David Boote appeared to be in control of his match from the start, his consistent play enabling him to build up a 4 Up lead after 11 holes. He finally saw off Gavin Hall, the 3rd seed, 3&2 on the 16th green. It is clear from today’s first round matches that almost anything can happen on the last 5 holes of Oakland Hill’s South Course. Europe convincingly beat USA 18.5-11.5 in the 2016 Arnold Palmer Cup (APC) played at Formby Golf Club. It was the sixth consecutive home victory and in the 20th Match reduced USA’s series lead to W10 L9 H1. French pair Antoine ROZNER and Robin SCIOT-SIEGRIST starred for Europe becoming the 17th and 18th players in the history of the competition to deliver 100% win records. Rico HOEY starred for USA winning both his Singles as well as his Fourball. He was the only American to win 3 matches. In his second APC match Adrian MERONK was again unbeaten. His overall playing record is now an impressive W3 H3 L0. Matthias SCHWAB was voted the recipient of the 2017 Arnold Palmer Invitational exemption. His English caddie Kieran OATES will join him at Bay Hill on the PGA Tour. Finally, Robin PETERSSON and Charlie DANIELSON were the recipients of the European and USA Michael Carter awards. The Arnold Palmer Cup is an annual team golf competition played between American college golfers and European college / university golfers. The Arnold Palmer Cup is organized by the Golf Coaches Association of America and golf legend Arnold Palmer. Mr. Palmer lent his name to the event in June 1997 and allowed it to be staged for the first time at his own Bay Hill Club in Florida. This year’s match, the 20th, is being played this coming weekend, 24-26th June, at Formby Golf Club in Lancashire, England. More information on the history of and future plans for the match can be found in an Appendix at the end of this article. The current match play format consists of foursome, fourball and singles matches. With a maximum total of 30 points available and one point awarded for each match a team will be required to accumulate 15.5 points to secure victory. Prior to the match commencing there has been a Junior Clinic staged today and there will be an Arnold Palmer Collegiate-Am competition tomorrow. Whilst more relevant to the European team it should be noted that selection is based on nationality not the location of the players’ educational establishments. All but two of the players competing at Formby have played their golf in the USA college system this season. Europe were due to be coached by Jean VAN DE VELDE (France) who captained the team at Rich Harvest Farms in 2015. However, his withdrawal has seen his Assistant Coach from last year JANICE MOODIE (Scotland), the former professional golfer, step up to the No. 1 role. Dean ROBERTSON (Stirling) will be Europe’s Assistant Coach this year. The highlight of this year’s match, at least for me, will be the first home appearance by Sam HORSFIELD. 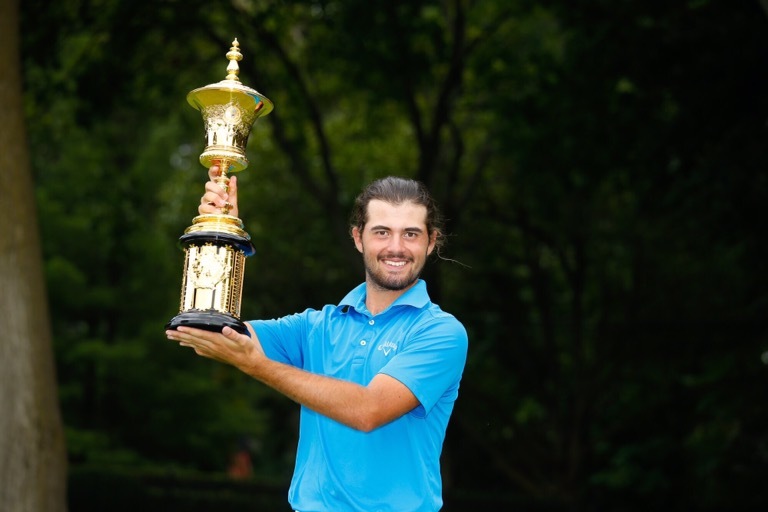 Horsfield (19), now ranked 3rd in the World Amateur Golf Rankings, was born in Manchester but having emigrated to Florida when he was four will finally make his competitive debut in the country of his birth. The USA have selected Mike COOK (Coastal Georgia) as their new Coach for 2016. He will be assisted by John HANDRIGAN (Florida). Of course the player Handrigan knows best, Sam Horsfield, will be playing for the opposition. * On 10th June 2016 Maverick McNEALY withdrew from the match due to an unspecified injury. His place was allocated to Doug GHIM (Texas) who is of course an excellent replacement. In 2015 Mr. Palmer agreed to allocate an Arnold Palmer Cup amateur invitation to his prestigious Arnold Palmer Invitational (API) tournament played annually at Bay Hill in Florida. Prior to the competition commencing each of the 20 players is asked to vote for a member of each team (excluding themselves) who they think best represents the “Arnold Palmer Legacy,” that is, the values that Arnold Palmer has exhibited during his legendary career. The player from the winning team who receives the most votes is awarded the API invitation. To take up his place in the field at Bay Hill the selected player must remain a collegiate golfer prior to the event. Prior to the match commencing – in fact it took place at 8.30am this morning – there is also a caddie draw involving young, local players. The caddie for the designated Arnold Palmer Cup player is also invited to Bay Hill. The first Arnold Palmer Cup API Exemption was awarded to Maverick McNealy. McNealy played in 2016 and his Arnold Palmer Cup caddie, Zach Urwiler (16), had the honour of caddying for him on the PGA Tour. This award is presented in honour of former GCAA Arnold Palmer Cup intern Michael Carter who tragically died in a car accident in 2002 aged 19. It is presented to the player from each team who best represents the qualities and fun-loving ideals that made Michael Carter unique. Hunter STEWART (USA) and Matthias SCHWAB (Europe) were honored in 2015. Formby Golf Club was established in 1884 and is a superb links course set close to the Irish Sea just north of Liverpool in the North West of England. Off the Blue Championship tees the course measures 7,031 yards, playing 3,380 yards out and a formidable 3,651 yards in. It has a par of 72. A little unusually it has 3 par 3’s and 3 par 5’s. The course record remains the 66 shot by Matt Jaeger at the 2009 Amateur Championship. The holes closest to the sea which run through undulating sand dunes and towering pines are amongst the most spectacular anywhere in Great Britain. As befits a course of this stature it has hosted many of our leading amateur golf events. It has hosted four Amateur Championships with Jose-Maria Olazabal (1984) and Matteo Manassero (2009) its most recent champions. The Club also hosted the Curtis Cup in 2004 and The Brabazon Trophy in 2013. This year it has already hosted the England v. France match and early in August will stage the Seniors Amateur Championship. Fri 24th June – Showers. Wind 11 mph W. Temp. Max. 16°C / Min 13°C. Sat 25th June – Sunny. Wind 13 mph NW. Temp. Max. 16°C / Min 13°C. Sun 26th June – Sunny. Wind 12 mph W. Temp. Max. 17°C / Min 14°C. The match was established by the Golf Coaches Association of America and first played in 1997. Known as simply the Palmer Cup back then it was originally played between 8-man teams from the USA and Great Britain and Ireland (GB&I). With the USA winning 4 and halving 1 of the first 6 matches a decision was taken after the 2002 match in Doonbeg, Ireland to extend the GB&I team to include Europe. A decision which of course helped to further differentiate the match from the biennial Walker Cup as well as increase it’s international appeal and competitiveness. In 2013 the teams were extended to 10 players. In 2014 the Golf Coaches Association of America announced that they had entered into a formal agreement with Arnold Palmer and his group of companies to jointly operate and expand the Palmer Cup. In 2015 the name of the match was changed to the Arnold Palmer Cup, effective from this week’s match in Formby. It was also announced that with effect from 2018 the match would become a mixed event with 12 men and women competing for each side. As one would expect the match has been played on some of most famous courses in the world. Including the 2016 match at Formby USA have the edge over GB&I / Europe with a won 10, lost 9 and halved 1 record over the 20 matches played to date. Europe – Luke Donald, Graeme McDowell, Joost Luiten, Francesco Molinari, Alex Noren and Richie Ramsay. USA – Ben Curtis, Bryson DeChambeau, Rickie Fowler, Lucas Glover, J.B. Holmes, Dustin Johnson, Matt Kucher, Hunter Mahan, Webb Simpson and Brandt Snedeker.